It started right away Friday at supper when the first of our special weekend guests arrived: 16 Methodist ministers, here for a retreat/planning weekend. They filled our guest wing and two hermitages. You won't be surprised to know that they were terrific, blended right in with the rhythm of the place, even our "temporary inconvenience, permanent improvement" eating facilities. They've made reservations for two more weekends this year and three for next year. The area bishop is asking all of his ministers to have these days once a year. April will bring another group from Erie and Crawford counties and then a third group in the fall. Best part? seven women and nine men. Oh, will it ever come? Then, down at the Big House on the Glinodo property were a dozen "girl friends," who came to us via a Mercyhurst contact, and held a retreat weekend together. Worse part? One of them was a former student of mine who came right up and introduced herself. She loved the weekend and telling me of her three children: all in their 20s!!! How can that be? Yikes! And best of everything? See our website for our new postulant, Jan. We are indeed blessed to have such seekers. 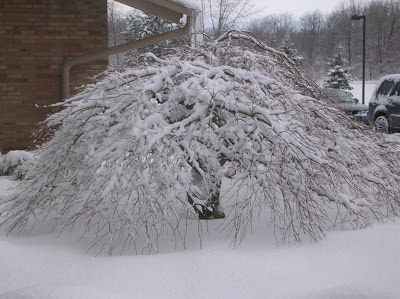 Finally, don't miss the new Winter Snow Meditation on our community website, too. The beautiful side of the 24" of snow we've received this past week! With great music.